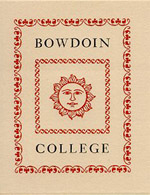 Bookplate for the Susan Dwight Bliss Collection, designed and printed by the Anthoensen Press of Portland, Maine. The Susan Dwight Bliss Collection, donated anonymously to the College by Miss Bliss between the early 1950s and 1965, contains about 1,200 volumes relating primarily to the fine arts, French and English history and literature, and European and Asian travel. The collection was begun by Miss Bliss's father, George T. Bliss; she shared his passion for books and continued to expand the collection after his death in 1901. The book collection is particularly noted for its many examples of fine and elaborate European bindings by such masters as Riviere and Son, Chambolle-Duru, Zaehnsdorf, Marius-Michel, Gruel, Bradstreet, Taffin, Meunier, and others. Many of these fine-bound volumes were acquired from the renowned Hoe sales of the late nineteenth century. This exhibit is designed to showcase the collection's fine bindings and to identify its sometimes rare and unusual texts. It is modified from a library exhibit shown from September 1997 to March 1998. This version of the display focuses on the books' bindings, many of which had been custom designed for Mr. or Miss Bliss. Thus far, only a small number of volumes are included herein; it is hoped that eventually all the bindings in the collection will be scanned and added to this exhibit. All the titles in this non-circulating collection are included in the Library's online catalog. They are available for research use by inquiring at Special Collections and Archives on the third floor of the Hawthorne-Longfellow Library.